Dr. Liz: Beef – A Nutritional Bargain! This week save $2 on our new USDA Choice Fresh to Market beef. You can also receive a free Burt’s Bees chap stick with this week’s coupon with a $10 Burt’s Bees purchase. Celebrate Dad with a big red. This is a polished, sophisticated wine at a great price! The St. Helena also makes a great pairing with our featured recipe! 750 ml. Next time you fire up the grill, try Char Crust® dry-rub seasonings to create a perfect crust that seals in the juices on your grilled meat, fish or vegetables. Keep Dad looking ship-shape with Burt's Bees Men's Natural Grooming Kit. This handy kit contains body wash, lip balm, soap, a sponge and aftershave, and it works for all skin types. Join Nugget Market and the Rocklin Chamber of Commerce for the first of the Evening in the Park summer series. This free concert event is family-friendly fun with a "Dad’s Night Out" theme on June 12th at Johnson Springview Park (5480 Fifth St. in Rocklin). Nugget Market will be there with a booth, samples, and other goodies to kick off the summer, from 7pm to 9pm. For more information, visit rocklinchamber.com. The Rotary Clubs of Cameron Park and El Dorado Hills present the Wine at Town Center event on Saturday, June 13, 2009, from 6pm to 9pm at the Town Center in El Dorado Hills. Nugget joins with more than 35 wineries and 20 local restaurants to offer wine samplings and delicious food from our Nugget kitchens. For more information, go to wineattowncenter.org. 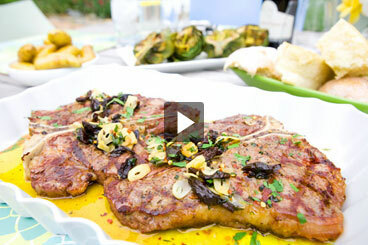 We think T-bones are the perfect steak for beef aficionados because they offer two cuts in one! On one side of the "T" rests the tenderloin (or filet), and on the other side, the strip loin. Our Fresh to Market T-bones are traditionally cut to about 3/4-inch thick; however, if you prefer them thicker, please ask our meat department associates to cut them to your liking. This week’s video features step-by-step instructions on how to grill dad the perfect T-bone, and you can even save $2 with this week’s coupon offer! When the temperatures climb, who wants to slave over a hot stove? 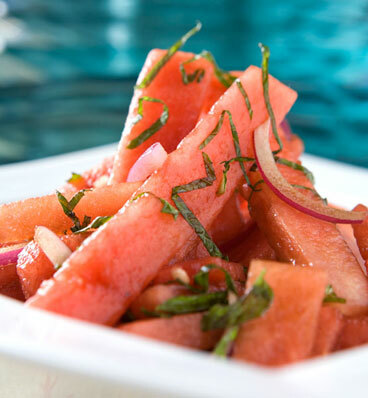 Make dinner cool and refreshing instead with our Watermelon Mint Salad. With sweet melon and tangy balsamic vinegar, this has a balanced flavor that is sure to delight. Pack it up for a picnic with our BBQ Chicken. 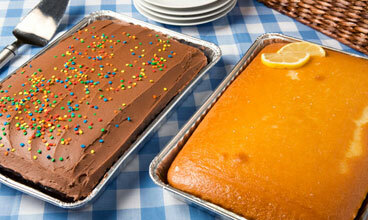 Simple and satisfying, Nugget Picnic Cakes are the perfect dessert for your next picnic or Father’s Day celebration. Our delectable varieties include chocolate cake with chocolate buttercream or German chocolate icing, and vanilla cake with vanilla buttercream or lemon glaze icing. Try grilling over a renewable resource: Green Hearts 100% Natural Charcoal Briquettes are made from Eucalyptus trees that replenish themselves after being harvested. These briquettes also burn hotter and longer than traditional charcoal, to sear in meat’s natural juices with a light wood-grilled flavor. Nugget carries gift cards from more than 50 major retailers — we’re sure you can find one that Dad will love! Beef – A Nutritional Bargain! Searching for a great nutritional value? Take a look at what beef offers. In just under 200 calories per three-ounce serving, beef packs an unbelievable number of key vitamins and minerals, and it is also surprisingly low in fat. Protein perfect: One serving contains 50 percent of the Daily Value for protein. And the mix of amino acids (building blocks of protein) are excellent at helping to build both lean muscles and a strong immune system. Vitamin array: One serving supplies 37 percent of your vitamin B12 needs, which is needed for healthy blood cells and nerve fibers. This wonder meat also comes packed with vitamin B6 and riboflavin, two B vitamins crucial for energy and protein metabolism. Easy on fat: Surprisingly, several cuts of beef are lower in fat than skinless chicken thighs. Select cuts such as tri-tip roast, top sirloin and top round steaks for low total fat and saturated fat counts.